Soccer Shots provides ArborCreek Montessori School’s on-site extracurricular soccer program during AfterCare hours. Soccer Shots is the national leader in youth soccer development for children ages 2 through 8. Their program has been created under the guidance of childhood education specialists, MLS® and USL® professional soccer players, and experienced and licensed soccer coaches. Their lesson plans are developmentally appropriate and tailored specifically to the three distinct age groups they teach. 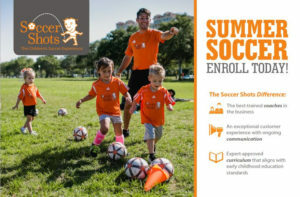 Using these creative and age-appropriate curricula and infusing each lesson plan with enthusiasm and structured activity, Soccer Shots aims to leave a lasting, positive impact on every child we serve. All soccer equipment is provided to program participants.